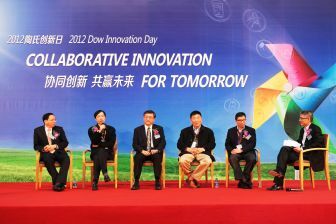 The Dow Chemical Company held its 4th annual Asia Pacific Innovation Day in Shanghai on 4th December, with the theme of “Collaborative Innovation for Tomorrow.” The event featured an innovation forum, Dow displays and an open tour of the labs at the Shanghai Dow Center. Dow innovators, business partners, government officials and experts from academic institutions gathered to explore collaborative innovation opportunities. Dow has been collaborated with many partners across the value chain in different industries for product innovation. For example, it formed a strategic partnership with Haier in 2009, it inaugurated a joint Material Research Center with Fudan University in early October in 2012, and it established the Dow Sustainability Innovation Student Challenge Award at four leading universities in China. The Asia Pacific Innovation Day has been held yearly since 2009, it shows Dow’s commitment to addressing world challenges through collaborative innovations with customers and partners throughout the Asia Pacific Region.